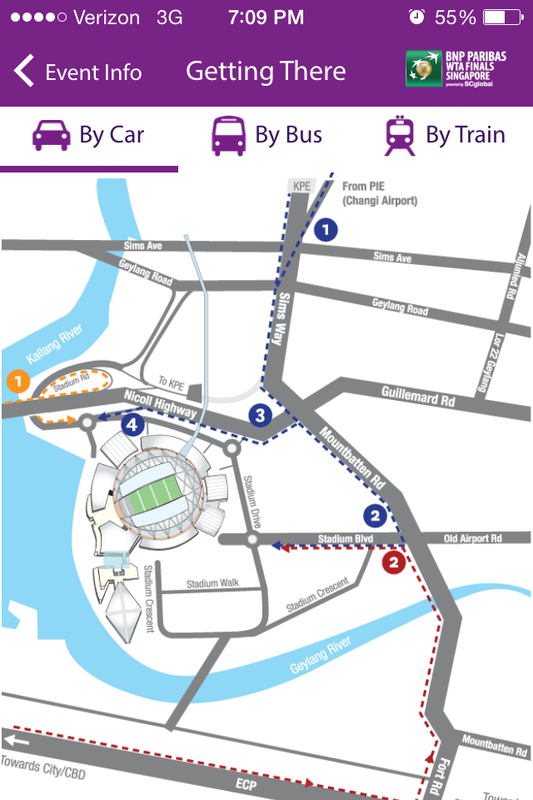 In an effort to connect to its fans across the world, the WTA partnered with SAP to release an official mobile app for the BNP Paribas WTA Finals ahead of the season-ending event in Singapore on Tuesday. The first edition of the app launched in the Apple App Store and Google Play, and features player information, facts and figures, and a whole host of goodies to satisfy you until the event gets underway on Oct. 20. 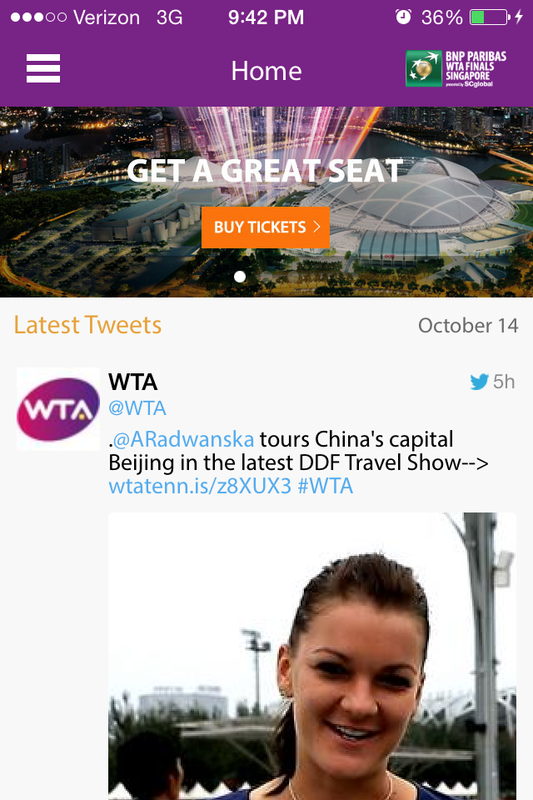 To test it out, I downloaded the WTA Finals app from Apple’s App Store and spent some time playing around with it. As far as design, the app is straightforward and the interface is easy to navigate. Perhaps a little clunky in presentation, but easy to view nonetheless. 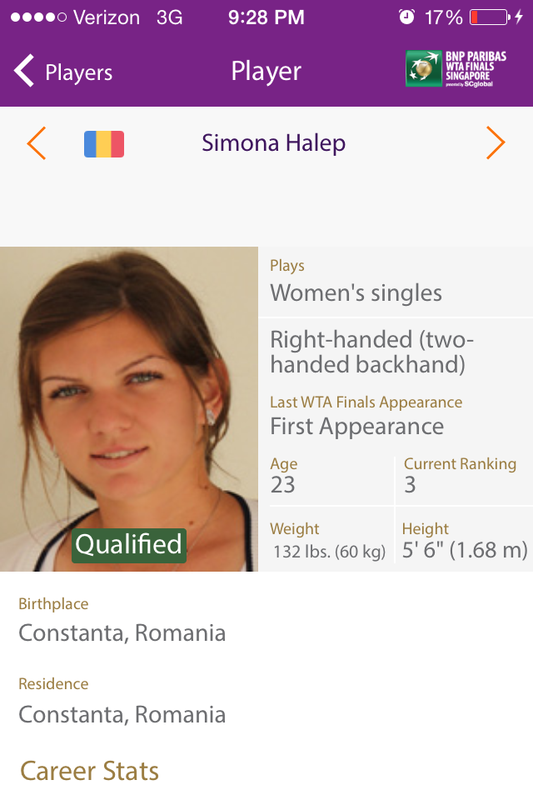 The app features an interactive Road to Singapore leaderboard, which is essentially for display now that the fields for both singles and doubles have been decided. 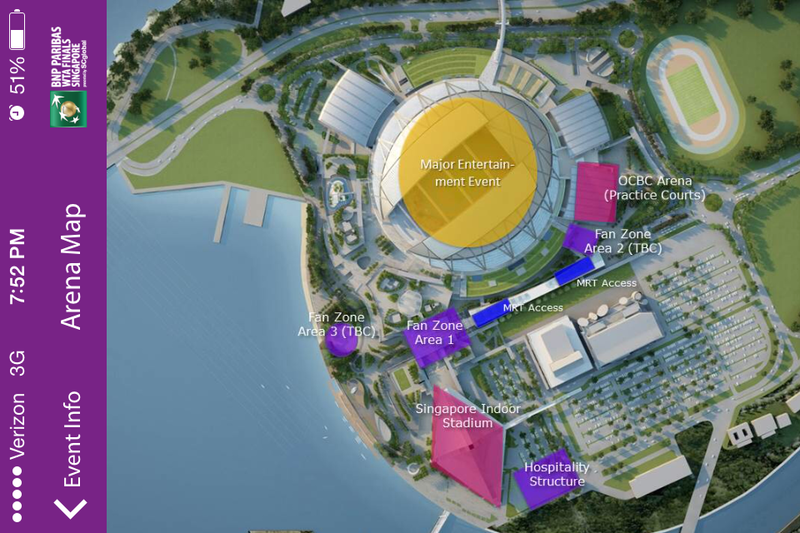 While the app provides some statistics on the players that will be featuring in Singapore in both singles and doubles, it perhaps misses the mark only because it could have included more. While the detailed player stats include career win/loss, last WTA Finals appearance, career titles and prize money, I would’ve liked to have seen more WTA Finals-centric stats, including event win/loss, or head-to-head against other players in the field. In fact, I would’ve like to have seen more stats in general – ranking the qualified players in all of the major categories (aces, double faults, service percentage, break points saved, etc. ), perhaps? A balance between easy-to-digest information and more detailed areas would strike a nice balance and appeal to both casual fans and tennis junkies. 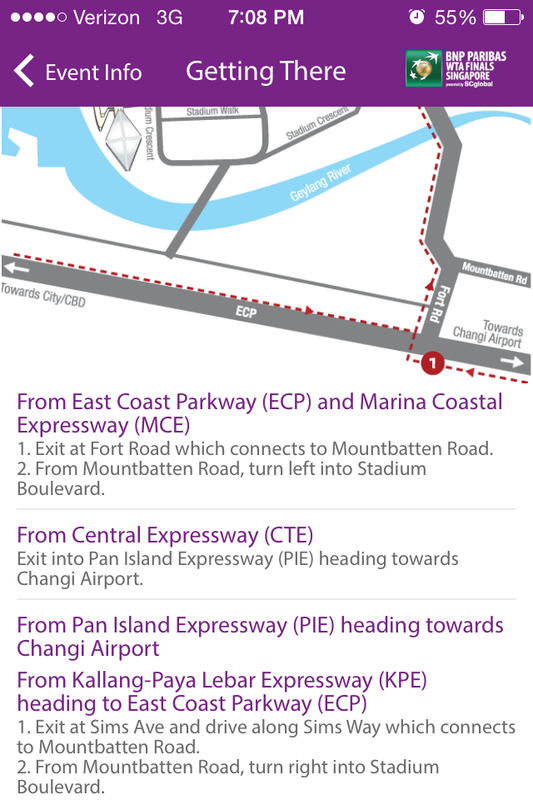 One of the highlight features of the app, however, is its “Event Info” section; it features directions to the Singapore Indoor Stadium by car, bus or train and syncs seamlessly with Apple Maps. 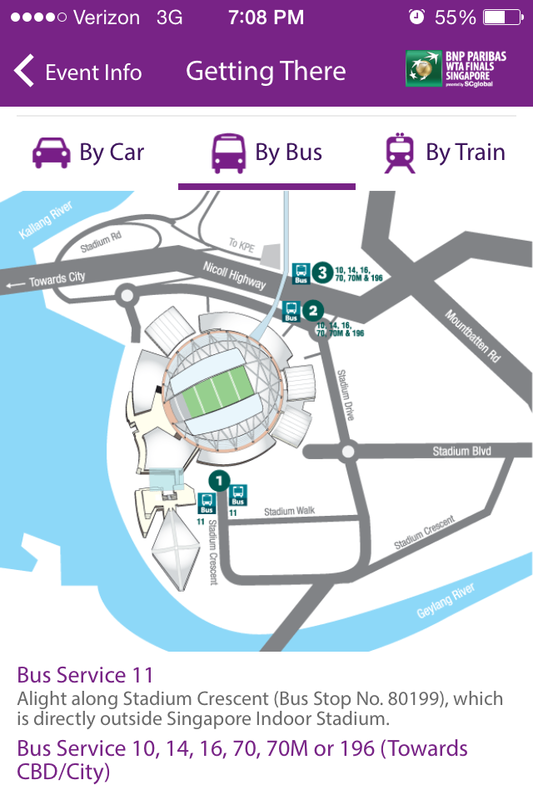 The section also features a seating chart, venue map and a timetable of opening times for each session. It will be interesting to see if it also features a timetable of practice times, autograph sessions or other special events the WTA has planned when the week-long party gets underway. 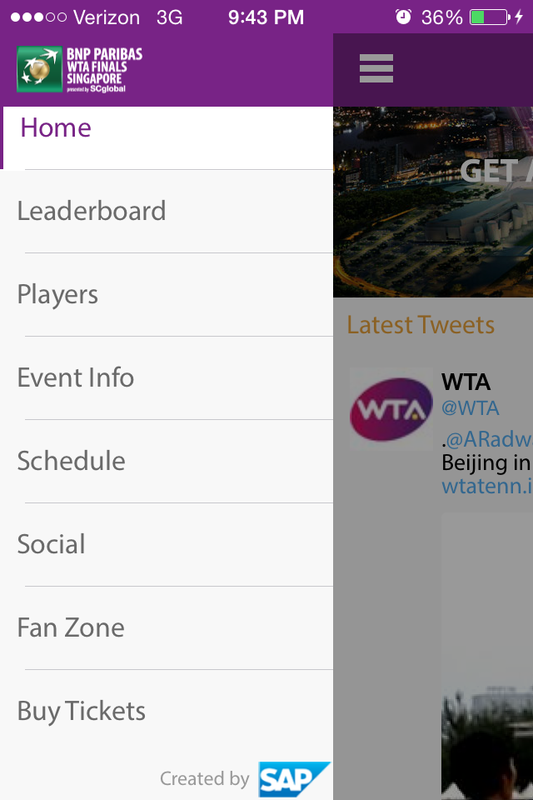 The app is incredibly fan-focused, from the “Fan Zone” section that features a poll and a fan photos area that aggregates Instagram and Twitter posts hashtagged #WTAFinals, to the “Social” section, the provides real-time updates from the WTA’s Twitter and Facebook feeds. 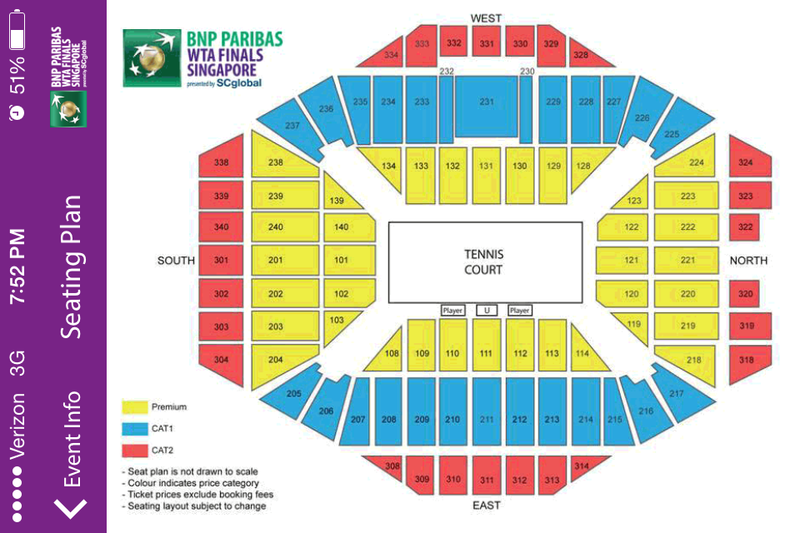 In addition, you can also buy tickets to each session, access the mobile version of www.wtafinals.com. According to the WTA, the app will also feature “Virtual Replay,” which is an innovation that allows users to track and replay ball movement, and “Leaderboard Stats,” a player comparison tool, once the event begins. All in all, the idea behind the app is a solid one. There might be room for improvement, but with a week to go until the action in Singapore, it’s a positive step towards the WTA’s goal of ideal fan engagement. 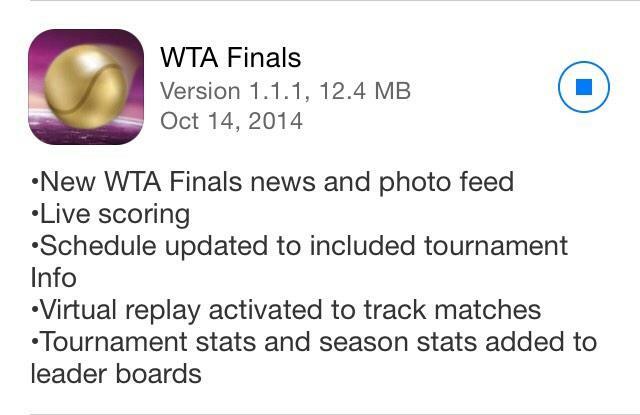 UPDATE: The WTA Finals app has released its first round of updates, and it looks like someone upstairs heard me. What do you think of the changes?